A new twist on an old favorite...our Gluten-Free White Chocolate Banana's Foster begins with our almond flour shortbread that has been prepared in our Gluten-Free room. We actually prepare the banana's foster just like they would for you in a fine restaurant table side. Brown sugar, butter, Meyer's Dark Rum, cinnamon and a hint of lemon are cooked until smooth and caramelized. We then add the banana's to our copper kettle with the sauce. Our banana's foster are now ready to be placed on the vanilla silk mousse that tastes just like a rich French vanilla ice cream. We then seal the banana's with our white chocolate banana silk and drizzle caramel over the top. If you're a Banana's Foster lover then this is the dessert for you! This dessert begins with either a vanilla wafer and caramel crust or our "Gluten Free" almond shortbread. A layer of our white chocolate pure vanilla silk mousse that taste's "JUST LIKE ICE CREAM" is topped with our banana's foster. We use "REAL" fresh banana's, Meyers dark rum, brown sugar, cinnamon and real fruit lemon puree to make the sauce. It is made in our large copper kettle. Once the sauce is made and it is a beautiful caramel sauce, the fresh banana's are placed in it just to caramelize the banana's. It is then cooled and placed on top of our mousse. A top layer of banana white chocolate silk and more caramel finish this dessert. 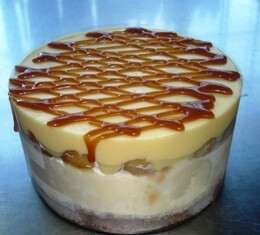 Your caramel for drizzling will come in its own bag since we wrap the dessert in clear wrap for shipping. This insures that you will not loose the delicious caramel on top when taking the clear wrap off. First Last Email Zip Code Please include me into the Inner Circle to receive free recipes and exciting updates!! !